It is looking increasingly likely, but not a given, that a reference to global net-zero emissions or even a specific goal to achieve net-zero emissions by a certain date (e.g. end of the century) will appear in the climate deal that is expected to emerge from the Paris COP at the end of this year. But like many such goals, it is both open to interpretation and raises questions as to how it might actually be achieved. Cumulative emissions of CO2 largely determine global mean surface warming by the late 21st century and beyond. Limiting risks across RFCs (Reasons for Concern) would imply a limit for cumulative emissions of CO2. Such a limit would require that global net emissions of CO2 eventually decrease to zero and would constrain annual emissions over the next few decades (Figure SPM.10) (high confidence). Net phase out of GHG emissions means that anthropogenic emissions of greenhouse gases to the atmosphere decrease to a level equal to or smaller than anthropogenic removals of greenhouse gases from the atmosphere. The above effectively means stabilization of the atmospheric concentration of CO2, which also aligns with the ultimate aim of the UNFCCC Convention (stabilization of greenhouse gas concentrations in the atmosphere at a level that would prevent dangerous anthropogenic interference with the climate system). This could still leave room for some level of emissions in that climate models show atmospheric concentration of carbon dioxide will decline if anthropogenic emissions abruptly stopped. In a 450 – 500 ppm stabilization scenario emissions could remain in the range 7-10 billion tonnes CO2 per annum without driving the atmospheric concentration higher. This is far below current levels (35 billion tonnes per annum from the energy system alone), but it isn’t zero. It can be classified as net-zero though, in that the atmospheric concentration isn’t rising. However, such an outcome, while stabilizing the atmospheric concentration may not be sufficient to prevent dangerous interference with the climate system. In that case an even lower level of emissions may be required, such that atmospheric concentrations do begin to fall and stabilize at a lower concentration. Another definition of net-zero may simply apply to anthropogenic emissions directly, irrespective of what the concentration in the atmosphere might be doing. In this case, any remaining emissions from anthropogenic sources (and there will be some) would have to be offset with sequestration of carbon dioxide, either via CCS or a permanent forestry solution. In the CCS case, the carbon dioxide would need to come from a bio-source, such as the combustion of biomass in a power station. This is what the IPCC have termed BECCS. A final step which goes beyond net-zero, is to have an anthropogenic net-negative emissions situation, which is drawing down on the level of carbon dioxide in the atmosphere through some anthropogenic process. This would be necessary to rapidly lower the concentration of carbon dioxide in the case of a significantly elevated level that comes about in the intervening years between now and the point at which the concentration stabilizes. Very large scale deployment of BECCS or an atmospheric capture solution with CCS would be required to achieve this. Finally, there is the consideration that needs to be given to greenhouse gases other than carbon dioxide. Methane for example, while a potent greenhouse gas, is relatively short lived (a decade) in the atmosphere so will require some thought. Even in a zero energy emissions system, methane from agriculture and cattle will doubtless remain a problem. Many look to renewable energy as a quick solution to the emissions issue, but the reality is far more complex. While we can imagine a power generation system that is at near zero emissions, made up of nuclear, renewables and fossil fuels with CCS, this is far from a complete solution. Electricity currently represents only 20% of the global final energy mix (see below, click for a larger image: Source IEA). Solutions will need to be found for a broad range of goods and services that give rise to greenhouse gas emissions, including non-energy sources such as limestone calcination for cement and cattle rearing for dairy and direct consumption. While we can also imagine a significant amount of global light transport migrating to electricity, shipping, heavy transport and aviation will not be so simple. Aviation in particular has no immediate solution other than through a biofuel route although there is some experimentation underway using high intensity solar to provide the energy for synthesis gas manufacture (from carbon dioxide and water), which is then converted to jet fuel via the well-established Fischer–Tropsch process. There are also dozens of industrial processes that rely on furnaces and high temperatures, typically powered by fuels such as natural gas. Metal smelting currently uses coal as the reducing agent, so a carbon based fuel is intrinsic to the process. Solutions will be required for all of these. Whether we aim for a very low level of emissions, true net-zero anthropogenic emissions or negative emissions is somewhat academic today, given the current level of emissions. All the aforementioned outcomes are going to require a radical re-engineering of the energy system in a relatively short amount of time (< 80 years). 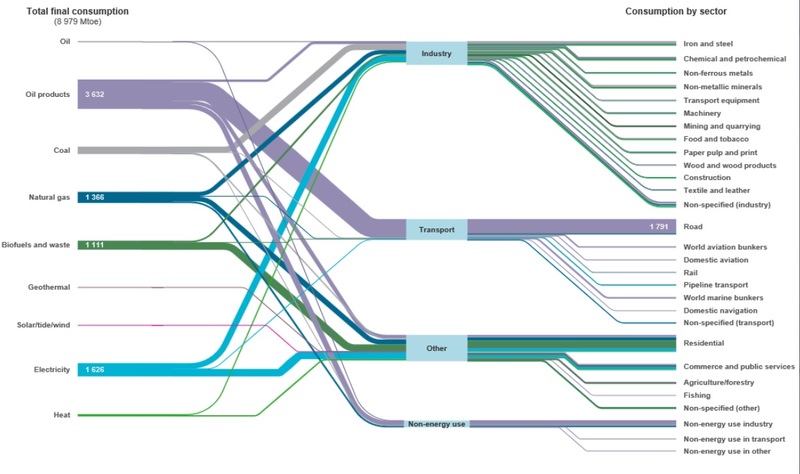 For anyone interested in very-low CO2 emissions energy emissions planning, I recommend checking out Mark Jacobson’s Stanford University webpage, and the SDSN’s Pathways to Deep Decarbonization. And of course, Amory Lovins is always interesting, on any energy topic. David, I am of the opinion that the past 20 years has been spent and wasted talking about the issue. Far simpler to search out methods which obviously stops carbon emissions, develop them and run with it in every way possible. Time to stop talking and engage with the innovators and not the same energy people who have a vested interest in not having a change. Energy Independence see my view on my website thehydrogenanswer.co.uk this is one variation of the method, there are two other which I know of and we need about 50 such systems. If the bath is overflowing, we need to turn the tap off. The problem is CO2 stop burning fossil fuels. If we stop burning fossil fuels and change to hydrogen then the atmosphere bio will correct itself. Like Africa, with electricity and hydrogen to fuel Electric tractors and cook food the trees planted would no longer be burnt for cooking etc. Like the UK Off-grid houses with Onsite low-voltage generation and hydrogen production for house and vehicle, zero emissions in use, financial saving for consumer increase in economy and jobs stops 5-6 Tonnes of CO2 and another 1 Tonne for the H2 EV. It can happen now, funding goes to FF and energy saving methods which only cut a small amount. We need a drastic decision, if we are to reduce the atmospheric levels of CO2 we have to shut down power stations which burn fossil fuels, this is not nice but it is absolutely essential and should have been underway for the past 20 years. There are many other things that link to it but that is the deciding factor for everyone to aim for the hydrogen economy and if the UK is to be a world leader it has to be the first with the decision. We should not allow the Parties to move this issue out of the election by all agreeing to agree that something has to be done, we want to know WHAT THEY ARE GOING TO DO!